Jolo’s Our Lady of Mount Carmel parish lost 15 of its members Sunday morning. They stopped living when a bomb shredded part of the cathedral. Maybe they survived the first blast, but not the second. Either way, they’re dead. So are five soldiers. Jolo is the capital of Sulu province, home to around 125,500 folks, and one of many municipalities not covered by Street View on Google Maps. The closest ‘street view’ area I found was Zamboanga City, Mindanao, about a hundred miles northeast of Jolo. Jolo is a little like my home town, if I think of Fargo-Moorhead as a single urban entity. The population is about the same as Fargo-Moorhead’s when I last lived there. Both are regionally-prominent spots in a country’s outlying regions. On the other hand, Fargo’s current temperature is 4° Fahrenheit/-16 C. At midday. In Jolo it’s 79° Fahrenheit/26 C, and two in the morning. If I unexpectedly woke up in Jolo, it wouldn’t take me long to realize that I wasn’t in the Upper Midwest any more. Regional cultures and histories are different, too. About six centuries back now, folks from the Middle East arrived in Jolo. I’m not sure how the first meetings went. By 1405 or so, Jolo was part of the Sultanate of Sulu and officially Muslim. My guess is that the local’s first encounters with foreign traders came much earlier. The city’s name, Jolo, apparently comes from ho lâng and ho ló, “good people” and “good community.” The names speak volumes, I think, of the folks living there and the Chinese traders. Traders noticed that material they left unattended on the shore was still there when they returned. Time passed, Ferdinand Magellan showed up in 1521 and said the Philippine islands belonged to Spain. Spain’s occupation forces followed, successfully held northern parts of the archipelago, but not the Sultanates. Jolo kept being a regionally-important port city. That probably helps explain why so many folks there have Chinese ancestors, who learned the local language — mostly in Singapore. Spanish authorities tried solving their Muslim problem by burning Jolo in 1876. They followed up by building the smallest walled city in the world — a distinction of sorts — possibly as a defense against other European forces who wanted a piece of the action. The United States acquired Spain’s claim to the Philippines in 1876, following traditional European habits for a while. We’ve learned quite a bit since then. What not to do, partly. 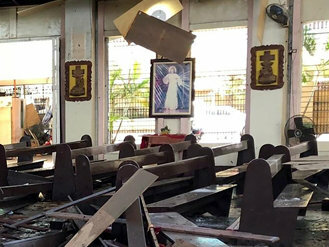 “Two bombs at a Roman Catholic cathedral in southern Philippines have killed 20 people and injured dozens more, local officials say. “The Islamic State (IS) group said it was behind the attack on Jolo island, where jihadist groups are active. “The first blast happened as Sunday Mass was being celebrated. A second device exploded outside as soldiers responded…. “…The local officials say the first blast happened at 08:45 local time (00:45 GMT) inside the Cathedral of Our Lady of Mount Carmel, which has been hit by bombs in the past. “The second explosion was shortly afterwards on the doorstep of the church. I’ve got mixed feelings about what happened in Jolo. Mostly, I’m angry and upset over the deaths and destruction. That makes ‘weeping with those who weep’ a bit easier. “Bless those who persecute [you], bless and do not curse them. Blessing folks who do this sort of thing — that’s probably easier for me than it is for folks closer to the attack. Even so, it’s not easy. But it’s still a good idea. That doesn’t keep me from realizing that others have their own perspectives. I can see how someone living in Jola might see a Christian church or cathedral in that light. Folks who decided to cooperate with the Sultanate of Sulu, back in 1405, might not have been insisted that later generations remember their pre-Islamic roots. In any case, six centuries is a long time. Long enough for family memories to get a tad fuzzy. The area’s more recent history hasn’t helped the situation either. My opinion. “ISIL claims responsibility for the attacks that killed 20 people and wounded more than 100. “…Sunday’s incident claimed the lives of at least 15 civilians and five soldiers, police said, adding that 111 others were wounded…. “…President Rodrigo Duterte’s spokesman Salvador Panelo condemned the ‘act of terrorism’ and vowed that government forces will pursue the perpetrators of the attack. “‘The Armed Forces of the Philippines will rise to the challenge and crush these godless criminals,’ he said. I figure someone, somewhere, has decided that Francis and Yousef are in cahoots, or Satanic stooges, or space-alien shape-shifting lizard-men. Or something equally colorful and unlikely. Back to death, destruction and Jola; sympathizing with folks in the Our Lady of Mount Carmel parish isn’t hard. We share the same faith, and apparently at least one of the same devotional habits. One of these days I may talk about how paying attention to Jesus and what our Lord said isn’t idolatry, but not today. Frothing radio preachers denouncing the ‘whore of Babylon’ helped me become a Catholic. Decades later, I may understand their viewpoint a little better; and even have a sort of sympathy for them. They may have seen ‘those Catholics’ as foreign agents, in thrall to a diabolical mastermind: a fifth column threat to their “Christian” America. Remembered rants of yesteryear help me understand why some folks in the Philippines might think bombing a “crusader temple” is a good idea. Understanding motives, or trying to, is one thing. Thinking that spitting venom is a good idea, or applauding mass murder, is another. In a way, I’m impressed that there isn’t more bloodshed in Jolla. Counting the cathedral, I found a half-dozen provocative landmarks within a mile of the city’s center. There’s the Tulay and Abu Harris mosques, a Sacred Heart of Jesus Chapel, and — right next to the Kasanyangan Mosque — the Notre Dame of Jolo School for Girls. On the other hand, I’m not all that surprised either. I figure that many, probably most, Christians and Muslims aren’t fanatic assassins or kill-crazy psychopaths. There’s the ‘don’t get mad, get even’ attitude; and that’s yet another topic. Instead, I’ll talk about life, dignity, and how that applies to lethal threats. This entry was posted in discursive detours and tagged getting a grip, history, legitimate defense, life issues, tolerance. Bookmark the permalink. May those killed at Jolo rest in eternal peace. It’s so sad. I pray for the mindset that leads people to kill in the name of their religion to understand God is love.